Sinus headache refers to head and facial pain associated with congestion, inflammation, or infection of the sinuses ( sinusitis ). The sinuses are hollow cavities in the skull that have openings into the nose. Colds and allergies cause congestion and inflammation of the nasal passages and can lead to sinusitis. Sinus headache is a symptom of sinusitis. Allergies and viral upper respiratory infections increase nasal secretions and cause tissue lining the nasal passages to swell. This results in nasal congestion and stuffiness. The opening into the sinuses become blocked and normal drainage cannot occur. Secretions that are trapped in the sinuses build up and may become infected with bacteria or, rarely, fungus. The swollen tissue, mucous build-up, or infection may create pain and pressure. Mist of saline nasal spray to moisten the nasal passages and help remove crusty secretions. A saline spray can be used up to 6 times per day. Use warm or cool compresses on your face. Do not smoke. If you smoke, talk to your doctor about how you can quit . Surgery is usually not required. People with a structural abnormality or chronic sinusitis that do not respond to medications may benefit from surgery. The doctor may perform one of several procedures to enlarge the opening to your sinuses or clean out your sinus cavities. Cady RK, Dodick DW, Levine HL, et al. Sinus headache: a neurology, otolaryngology, allergy, and primary care consensus on diagnosis and treatment. Mayo Clinic Proc. 2005;80(7):908-816. Hainer BL, Matheson EM. Approach to acute headache in adults. Am Fam Physician. 2013;87(10):682-687. Headache. EBSCO DynaMed Plus website. Available at: http://www.dynamed.com/topics/dmp~AN~T114773/Headache . Updated May 22, 2017. Accessed September 26, 2017. Sinus headache. National Headache Foundation website. Available at: http://www.headaches.org/2007/10/25/sinus-headache. Accessed September 26, 2017. Sinus headaches. American Academy of Otolaryngology website. Available at: http://www.entnet.org/?q=node/1410. Accessed September 26, 2017. 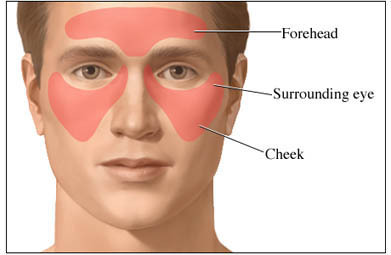 Sinusitis (sinus infection or sinus inflammation). Asthma and Allergy Foundation of America website. Available at: http://www.aafa.org/display.cfm?id=9&sub=18&cont=240. Accessed September 26, 2017.